IT Engineers are involved in managing the computer systems including hardware, software, and networks of an organization. 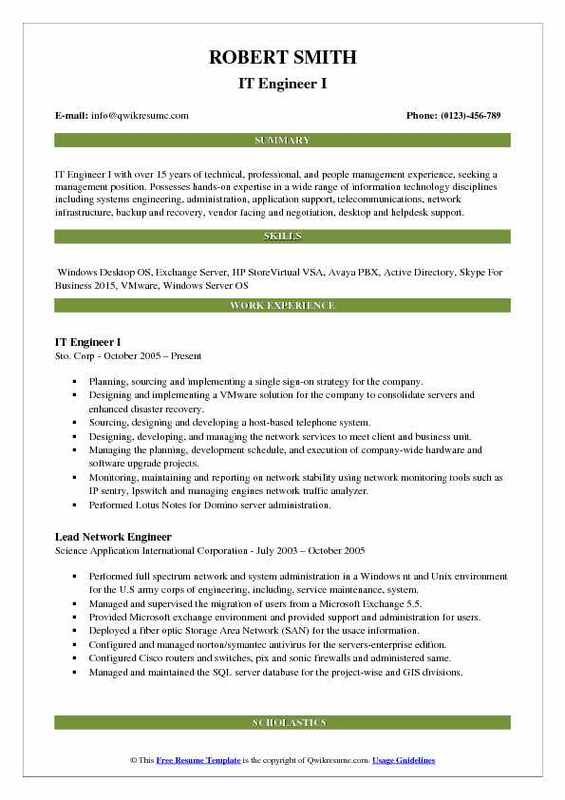 Apart from job tasks such as designing, supporting and installing the entire system, an IT Engineer Resume also mentions job tasks such as – installing new hardware and software, setting up accounts and password for every employee, monitoring the safety of computer system, fixing network issues, installing antivirus protection, delivering IT solutions to fix company’s problems and training the staff on new systems. It is possible to get started in this line by demonstrating IT skills such as – broad knowledge of technologies and security protocols; knowledge of IT systems, database systems and network infrastructure, proficiency in MS Office, VM ware, SQL and Oracle; working knowledge on various programming language such as C++ or FORTRAN; experience with web application development and the ability to juggle between various projects. Almost all IT Engineers depict a Bachelor’s degree in Computer Science or IT or Information science. Summary : Highly capable, versatile and accomplished Senior IT Engineer with more than 8 years extensive management experience, planning and implementing computer systems and networks. I have in-depth knowledge of System Development Life Cycle and participated in Web-software development as Web Server Administrator. Managed the installation, configuration, maintenance, upgrade and backups of Windows and Linux web-servers for both company and clients. Deployed web-server (lamp) stack on client machines, including customized CMS and optimization of the server configuration. Maintained and debugged open source CMS websites, optimized MYSQL queries, customized components and layouts and implemented security measures. Performed final post-production QA testing and took the decision about releasing bug fix patches, stable/beta versions, and other release issues. Administered and configured web-hosting control panels: cPanel, Plesk, DirectAdmin, H-sphere, ISPConfig. Managed and configured firewalls for windows (Kerio, Forefront) and Linux (IPtables, APF, fail2ban). Installed, configured and managed MySQL service including backups, migration, and optimization. Created and optimized DBMS queries for CRM and ERP systems for various company needs. Cooperated with developer team regarding optimization and tuning MySQL queries for commercial software. Summary : Motivated IT Engineer II with 14 years of experience in the Finance domain, possessing exceptional customer service, and troubleshooting skills for networking issues, and end-user problems. Acting as primary contact for computer hardware and software problems, as well as network emergencies. Responding to all client requests for technical support by phone, email and the inter-office chat service. Setting up new hire accounts using active roles responsible for daily PC/Laptop printing and video. Conferencing the issues, also for users home via VPN or using Citrix from home. Setting up and configuring new hire PC/Laptop using an image from deployment console setup hardware in office or cube. Installing additional applications as needed using Symantec management console. Setting up iPhone/Android for good technology, setup RSA soft token for VPN use. Daily testing of video conference units, setting up video conference calls for users between offices. Maintaining licensing for software outside of whats on the corporate image for installs. Setting up Lotus Notes for database use only use Domino administrator to add user permissions to databases. Migrating interactive data user machines from IDCO domain over to intercontinental. Using Altiris deployment console, logging into Cisco switch set port to correct VLAN, and reserve IP in DCHP. 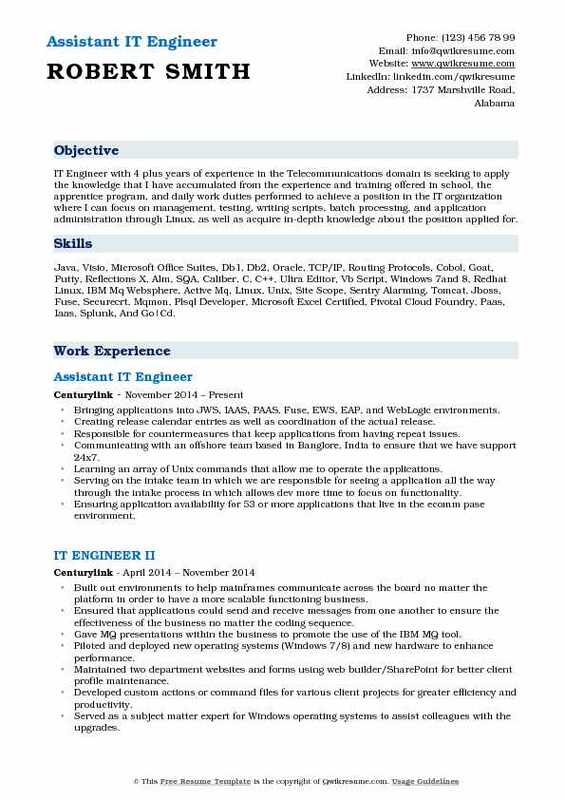 Summary : IT Engineer I with over 15 years of technical, professional, and people management experience, seeking a management position. Possesses hands-on expertise in a wide range of information technology disciplines including systems engineering, administration, application support, telecommunications, network infrastructure, backup and recovery, vendor facing and negotiation, desktop and helpdesk support. Planning, sourcing and implementing a single sign-on strategy for the company. Designing and implementing a VMware solution for the company to consolidate servers and enhanced disaster recovery. Sourcing, designing and developing a host-based telephone system. Designing, developing, and managing the network services to meet client and business unit. Managing the planning, development schedule, and execution of company-wide hardware and software upgrade projects. Monitoring, maintaining and reporting on network stability using network monitoring tools such as IP sentry, Ipswitch and managing engines network traffic analyzer. Performed Lotus Notes for Domino server administration. Planning, deploying, managing, and maintaining company-wide Blackberry enterprise server. Configuring, deploying and maintaining the Cisco firewalls, switches and routers. 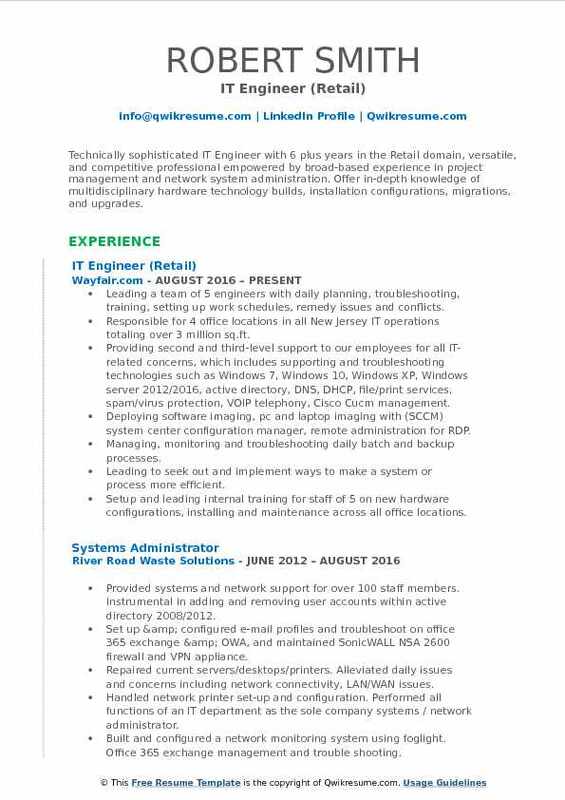 Leading the infrastructure engineer charged with moving company to the cloud, and currently working on lotuslive notes, virtual desktop and hosted telephone services. 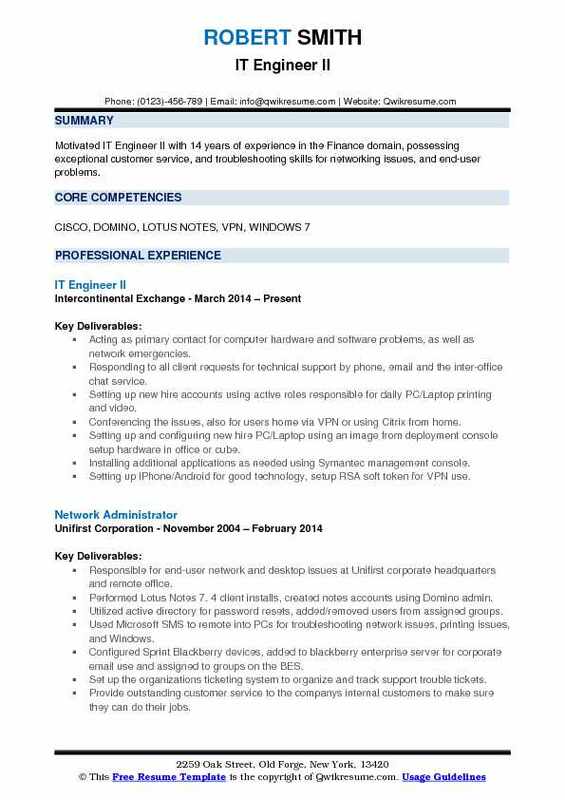 Headline : Technically sophisticated IT Engineer with 6 plus years in the Retail domain, versatile, and competitive professional empowered by broad-based experience in project management and network system administration. Offer in-depth knowledge of multidisciplinary hardware technology builds, installation configurations, migrations, and upgrades. Leading a team of 5 engineers with daily planning, troubleshooting, training, setting up work schedules, remedy issues and conflicts. Responsible for 4 office locations in all New Jersey IT operations totaling over 3 million sq.ft. Providing second and third-level support to our employees for all IT-related concerns, which includes supporting and troubleshooting technologies such as Windows 7, Windows 10, Windows XP, Windows server 2012/2016, active directory, DNS, DHCP, file/print services, spam/virus protection, VOIP telephony, Cisco Cucm management. Deploying software imaging, pc and laptop imaging with (SCCM) system center configuration manager, remote administration for RDP. Managing, monitoring and troubleshooting daily batch and backup processes. Leading to seek out and implement ways to make a system or process more efficient. Setup and leading internal training for staff of 5 on new hardware configurations, installing and maintenance across all office locations. Completing migration of Aerohive WAPS from old outdated hardware to new hardware over 300 devices across all warehouses. Networking and configuring 20-million-dollar conveyor system for shipping production 80k thousand packages a week and maintaining a network for the conveyor system. Headline : Motivated informational and business technology professional seeking opportunities in Fortune 500 firms. Utilize best practices and technology capabilities across business units, with a passion for innovation. Manage day to day requests/incidents, support applications, and websites. Cross-functional collaboration with business partners, vendors, and colleagues. 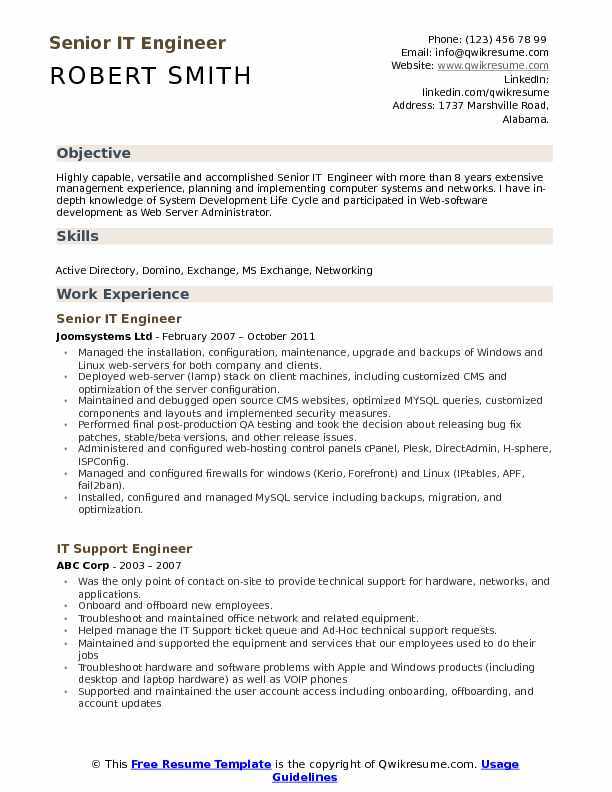 Skills include systems administration, technical support, computer training, and project management. Managed and support laboratory machines and servers for research and vaccines departments. Served as a single point of contact to business stakeholders for technology requests and incidents. Assisted with technology solutions for a variety of departments to support the business objectives and goals. Utilized analytical skills to interpret business requirements, and transform into technology requirements. Identified improvements and provided technical recommendations thru engagements with the infrastructure team. Researched, tested, and implemented new technologies and applications to ensure a high level of excellence for support. Successfully trained Vaccines and Oncology scientists in application to promote consistency of scientific experiment creations. Lead support for Eworkbook application for 285 colleagues. Increased network speed for Oncology building to 1gigabit, increasing productivity by 35%. Supported multiple applications, websites, and lab systems (Cellomics, Columbus, Eworkbook, open lab, opera, velocity, miseq, oru websites, and freezerpro) for onc/vaccines departments, ensuring a stable computing environment. Provided white glove support to clients in response to service center tickets, service requests, Ad hoc requests, or meetings to resolve issues effectively. Installed and configured the software to maintain compliance. 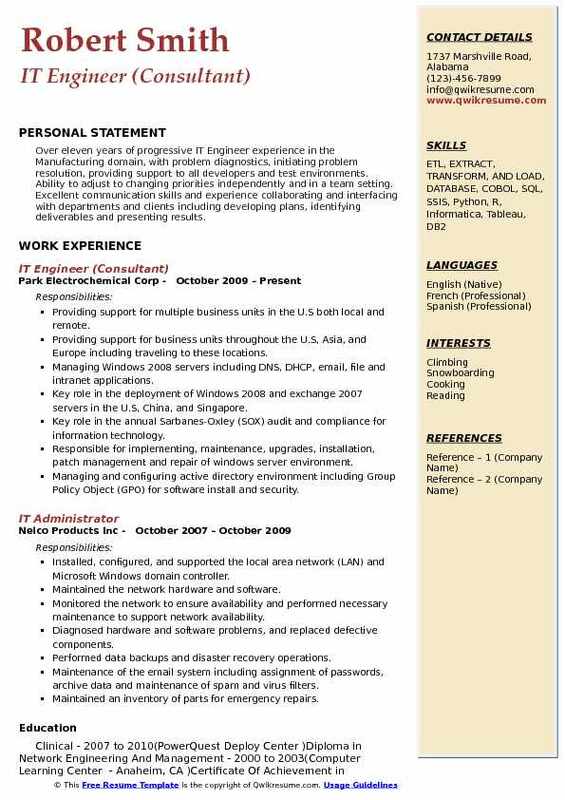 Objective : IT Engineer with 4 plus years of experience in the Telecommunications domain is seeking to apply the knowledge that I have accumulated from the experience and training offered in school, the apprentice program, and daily work duties performed to achieve a position in the IT organization where I can focus on management, testing, writing scripts, batch processing, and application administration through Linux, as well as acquire in-depth knowledge about the position applied for. 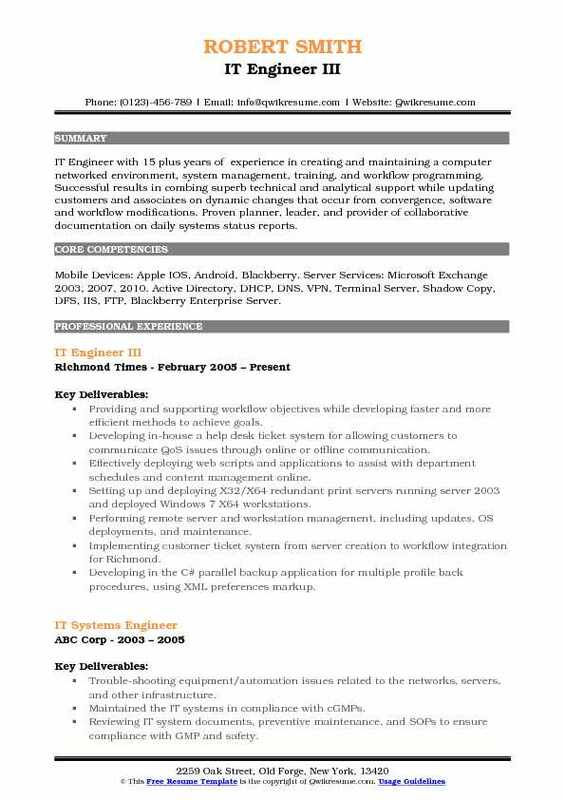 Skills : Java, Visio, Microsoft Office Suites, Db1, Db2, Oracle, TCP/IP, Routing Protocols, Cobol, Goat, Putty, Reflections X, Alm, SQA, Caliber, C, C++, Ultra Editor, Vb Script, Windows 7and 8, Redhat Linux, IBM Mq Websphere, Active Mq, Linux, Unix, Site Scope, Sentry Alarming, Tomcat, Jboss, Fuse, Securecrt, Mqmon, Plsql Developer, Microsoft Excel Certified, Pivotal Cloud Foundry, Paas, Iaas, Splunk, And Go|Cd. Bringing applications into JWS, IAAS, PAAS, Fuse, EWS, EAP, and WebLogic environments. Creating release calendar entries as well as coordination of the actual release. Responsible for countermeasures that keep applications from having repeat issues. Communicating with an offshore team based in Banglore, India to ensure that we have support 24x7. Learning an array of Unix commands that allow me to operate the applications. Serving on the intake team in which we are responsible for seeing a application all the way through the intake process in which allows dev more time to focus on functionality. Ensuring application availability for 53 or more applications that live in the ecomm pase environment. Responsible for migrating code, hot fixes, and patches to applications. On call rotations including weekends for the whole Ecomm pase team that includes over 300 applications. Actively engaging in SWAT calls to adhere to any outages related to all applications. Monitoring central log tools, sitescope, and nettools for all alarms. Responsible for creating, maintaining, and owning 700+ application/lookids for application use. Summary : An Engineer IT with years 10 years of experience working collaboratively with teams across an organization to analyze and clarify users requirements, features, and acceptance criteria. I am a passionate individual with the ability to multi-task effectively and capable of leading test effort for features which includes test scenarios, creating test plans, implementing executing test cases in Quality Center and Agile Scrum. Skills : iOS/Android/Windows/BlackBerry OS beta/production Afaria MDM device management and administration BlackBerry 10 BAS device management and administration Mobile Mail/Active Sync, AnyConnect VPN, Cisco Jabber, Cisco Spark and Cisco WebEx Wireless 802.1x, Cisco CVO, VoIP Phones and video conference system (Cisco DX and EX series). Extensive experience testing mobile (IOS, Android, Windows, and Blackberry). Lead testing effort for features, functionality which includes test scenarios, created test plans and executed test cases across all functional areas of our products. Developed, updated and maintained the quality testing standards and procedures. Participated in the coordination and updated test release installation procedures and execution of release testing. Collaborated with development teams to gather new feature requirements and communicated effectively to all stakeholders. Partnered with Apple and Samsung to test development Apple IOS, Android OS, mobile applications, upgraded software packages, reported problems/feedbacks as needed. Hands on experience with logs capturing necessary details of the device. Monitored trouble tickets and worked issues through to problem resolution. Authored required documentation for application installation, support and end-user support, including policies and procedures, knowledgebase articles, and change plans. Coordinated with different functional teams to investigate performance issues, determined root cause devised remediation plan and defined the implementation plan. 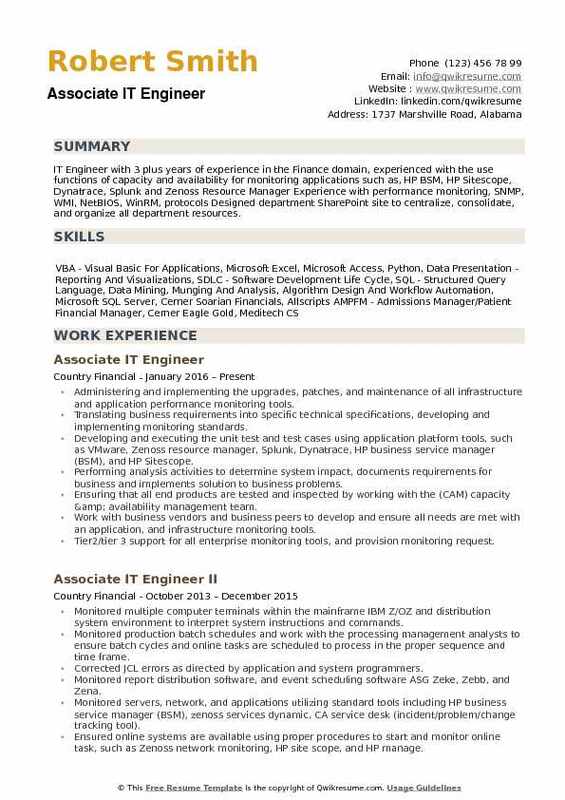 Summary : IT Engineer with 15 plus years of experience in creating and maintaining a computer networked environment, system management, training, and workflow programming. Successful results in combing superb technical and analytical support while updating customers and associates on dynamic changes that occur from convergence, software and workflow modifications. Proven planner, leader, and provider of collaborative documentation on daily systems status reports. Skills : Mobile Devices: Apple IOS, Android, Blackberry. Server Services: Microsoft Exchange 2003, 2007, 2010. Active Directory, DHCP, DNS, VPN, Terminal Server, Shadow Copy, DFS, IIS, FTP, Blackberry Enterprise Server. Providing and supporting workflow objectives while developing faster and more efficient methods to achieve goals. Developing in-house a help desk ticket system for allowing customers to communicate QoS issues through online or offline communication. Effectively deploying web scripts and applications to assist with department schedules and content management online. Setting up and deploying X32/X64 redundant print servers running server 2003 and deployed Windows 7 X64 workstations. Performing remote server and workstation management, including updates, OS deployments, and maintenance. Implementing customer ticket system from server creation to workflow integration for Richmond. Developing in the C# parallel backup application for multiple profile back procedures, using XML preferences markup. Developing in C# wallpaper flicker, an application that will update your desktop wallpaper in a single click. Developing an intranet web-based employee scheduler application for assisting manager scheduling shifts. Creating a file monitor application that is responsible for managing the investors business daily publication and sending files to plate makers in the hanover plate room. 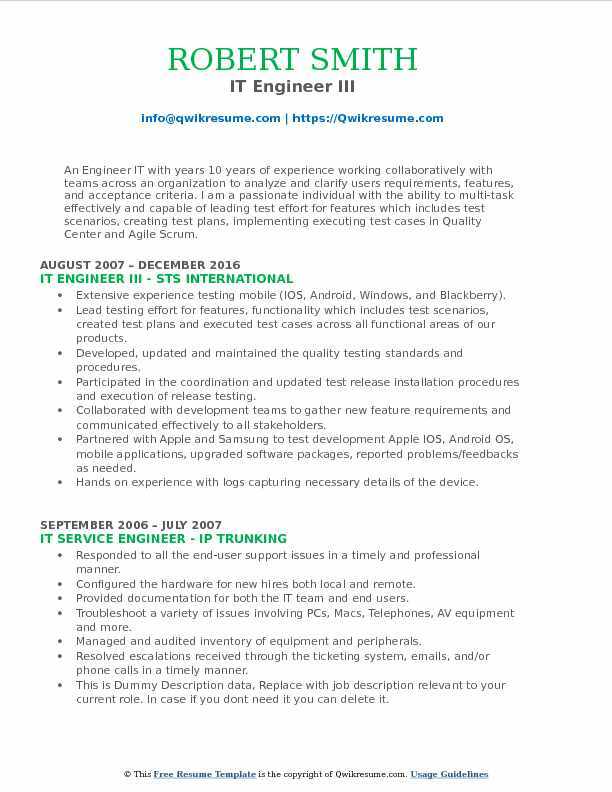 Summary : Over eleven years of progressive IT Engineer experience in the Manufacturing domain, with problem diagnostics, initiating problem resolution, providing support to all developers and test environments. Ability to adjust to changing priorities independently and in a team setting. Excellent communication skills and experience collaborating and interfacing with departments and clients including developing plans, identifying deliverables and presenting results. Providing support for multiple business units in the U.S both local and remote. Providing support for business units throughout the U.S, Asia, and Europe including traveling to these locations. Managing Windows 2008 servers including DNS, DHCP, email, file and intranet applications. Key role in the deployment of Windows 2008 and exchange 2007 servers in the U.S, China, and Singapore. Key role in the annual Sarbanes-Oxley (SOX) audit and compliance for information technology. Responsible for implementing, maintenance, upgrades, installation, patch management and repair of windows server environment. Managing and configuring active directory environment including Group Policy Object (GPO) for software install and security. Managing and configuring several various engineering applications for high-end parts development. Implementing companywide anti-virus protection using Symantec Endpoint Protection. Implementing and managing companywide data backup solution using Symantec Backup Exec. Investigating the human resources and legal department requests for email and web content data reviews. Handleing and troubleshooting all first, second and third tier support calls and incidents. 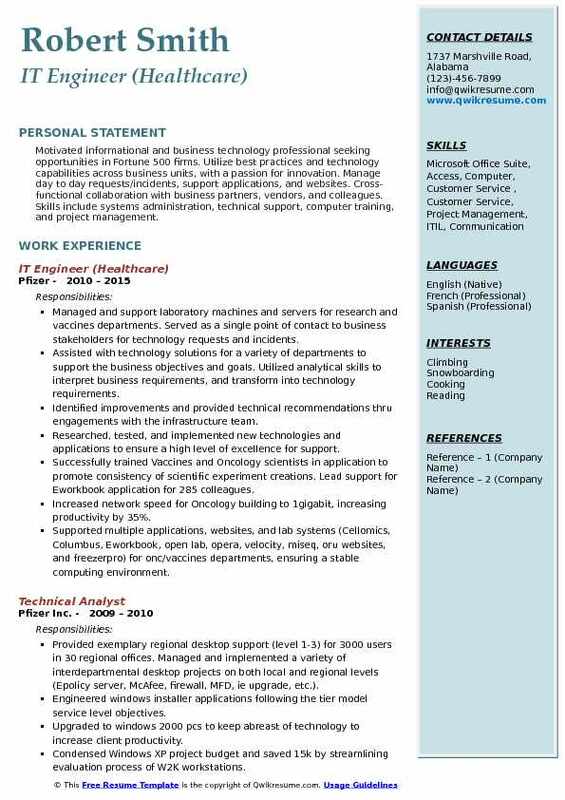 Objective : IT Engineer with 3 plus years of experience in the Finance domain, experienced with the use functions of capacity and availability for monitoring applications such as, HP BSM, HP Sitescope, Dynatrace, Splunk and Zenoss Resource Manager Experience with performance monitoring, SNMP, WMI, NetBIOS, WinRM, protocols Designed department SharePoint site to centralize, consolidate, and organize all department resources. Administering and implementing the upgrades, patches, and maintenance of all infrastructure and application performance monitoring tools. Translating business requirements into specific technical specifications, developing and implementing monitoring standards. Developing and executing the unit test and test cases using application platform tools, such as VMware, Zenoss resource manager, Splunk, Dynatrace, HP business service manager (BSM), and HP Sitescope. Performing analysis activities to determine system impact, documents requirements for business and implements solution to business problems. Ensuring that all end products are tested and inspected by working with the (CAM) capacity & availability management team. Work with business vendors and business peers to develop and ensure all needs are met with an application, and infrastructure monitoring tools. Tier2/tier 3 support for all enterprise monitoring tools, and provision monitoring request. Ensuring online systems are available using proper procedures to start and monitor online task. Working with vendors on licensing and life cycle of monitoring application tools. Providing metrics and reporting analysis for business-critical applications and service desk incident and problem management.